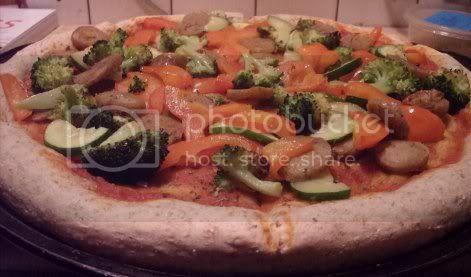 I made the “Sausage,” Bell Pepper, Broccoli, and Zucchini pizza from Vegan Express. Half-white, half-wheat crust topped with Newman’s marinara sauce, crushed red pepper, Italian seasoning, and garlic powder. Everything else gets tossed with olive oil and roasted in the oven before being dumped on top and devoured. What sort of pizza did you have? In need of pizza inspiration? Try Mark Sutton’s amazing book, Heart Healthy Pizza! That looks great! I made a refried bean and kale pizza. I really love the new design of your blog. Sorry I haven’t mentioned it sooner! Mmm, refried beans and kale! That sounds awesome.